A binary star system about 1,800 light years away could violently merge, and we might be able to see the show here on Earth. Set a reminder to look up at the stars more in 2022. You might see a star explode. About 1,800 light-years away — in the left wing of the constellation Cygnus — is a binary star system that scientists say is getting ready to merge and form a red nova. A nova often begins as a binary star system where the more massive star is a white dwarf and steals hydrogen from its partner. When it collects enough, the hydrogen explodes outward. Because the two stars share a communal atmosphere, the system is a perfect candidate for this type of phenomenon. 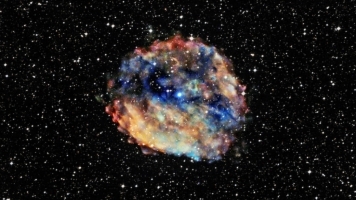 Two astronomers predicted the nova back in 2015. Since then, they've done "two strong tests" and say their hypothesis is still "holding up." Right now, the two stars are too dim to see with the naked eye, but if they do merge, the nova should create a new visible star in the sky. This won't be the first red nova scientists have watched, but it's the first time they will have predicted one — if it comes to pass.